You can’t do the complicated stuff with being clear on the simple stuff. So to clarify semi-direct products lets start with pretty much the simplest case. C3xC2 = C6 is a direct product. 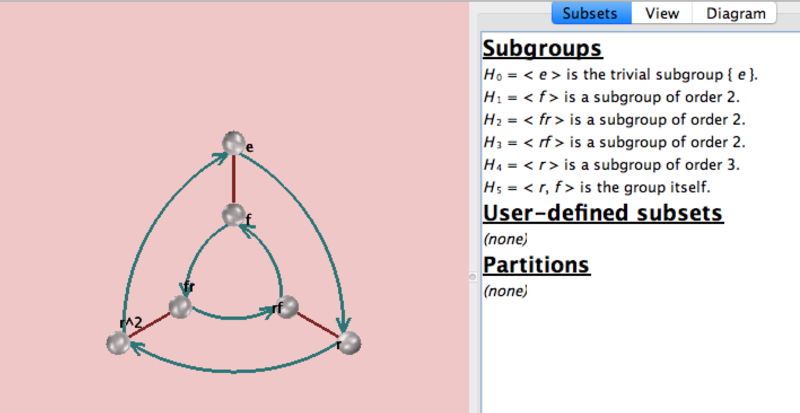 Thus, C3 and C2 are normal subgroups of the cyclic group C6 which has order 6. C3⋊C2 = S3 is a semi-direct product. Only C3 is a subgroup of the symmetric group S3 which also has order 6. C6 and S3 are the only 2 groups of order 6. The identity automorphism is used in the first, direct product, case to build C6. 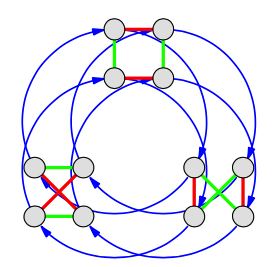 The bijective automorphism of C3 is used to build S3. The second Cayley diagram below for S3 shows how C2 is used to map the identity automorphism to the bijective one via a semi-direct product. 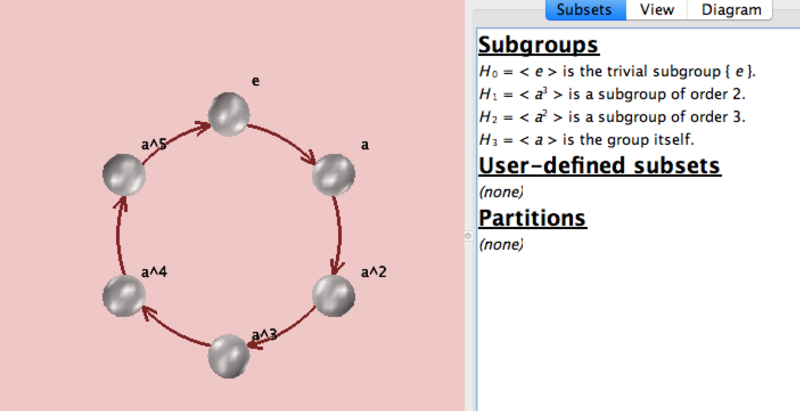 The inner circle goes in the reverse direction of the outer circle. Generators for S3 are r³= f²= 1. And fr=r²f. 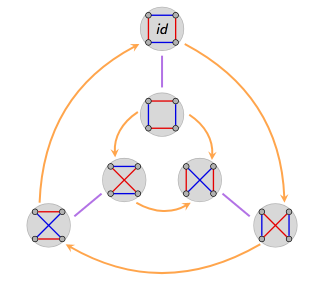 S3 is isomorphic to the dihedral group of same order, sometimes called D3, sometimes called D6. So that’s the simple case. Let’s move up to the a larger example: A4. (C2×C2) is the Klein 4 group, aka V4. V4 is normal in A4, so the semi-direct product of v4⋊C3 will involve an automorphism of V4 by C3. The point of Figure 4 is to provide an intuition showing that A4 is the semi-direct product of C3 and the injective automorphism of V4. 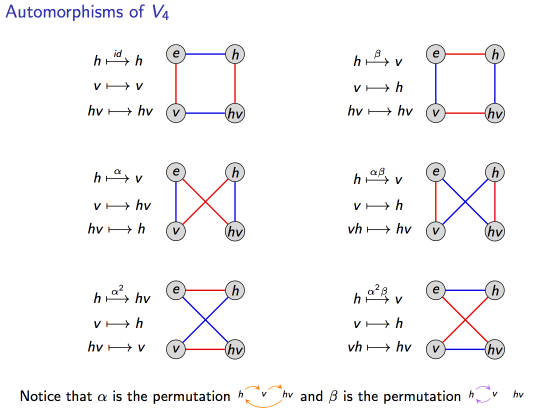 I don’t find the wiring diagrams of the V4 automorphisms in Figure 3 very intuitive, but Figures 4 demonstrates that there are 2 possibilities when choosing the automorphisms, one choice (the outer ring in Figure 4) leads to a direct product, the other choice leads to the semi-direct product A4 as shown in Figure 5. Algebra: Chapter 0, Part 0. By Paolo Aluffi. Page 232.